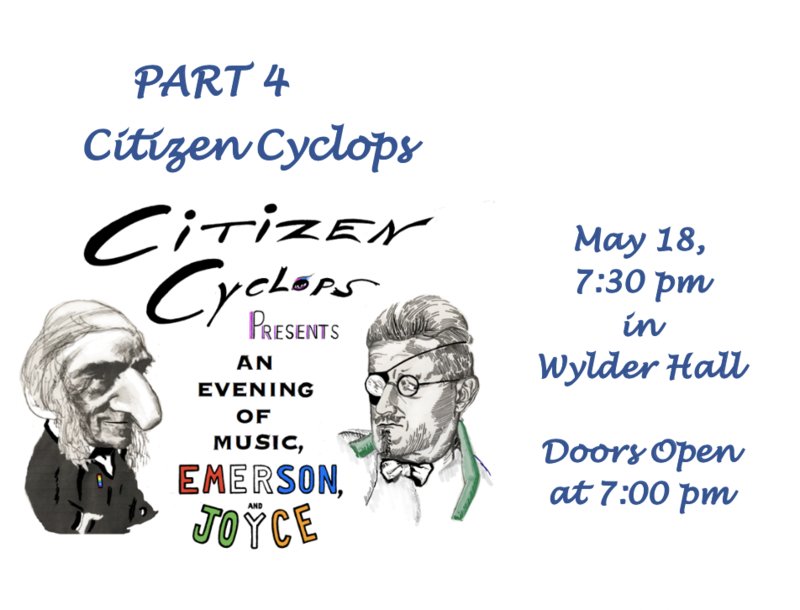 Citizen Cyclops is a musical ensemble comprised of multi instrumentalists Paul Martin Toth and Sam Montooth. Through the use of real-time looping, Paul and Sam use this unique palette to create music which will guide you through the words, history and circumstances of two “understood” historical figures. Ralph Waldo Emerson and James Augustine Aloysius Joyce lived on different continents, during two different times, and are rarely written in the same sentence. Though the two were outwardly very different people; Emerson gentle and formal, Joyce hedonistic and quite informal, ultimately they agree on the most fundamental of levels; real, human morality. Through music, spoken word, and a multimedia presentation, Paul and Sam would like to take you on a journey through early life encounters, perceptions entrenched or evolving, and subtle glimpses of humanity that only music and lyric can bring to life.